I love adding haloumi to big veggie bowls for extra protein and deliciousness. Top this bowl with some roasted pistachios, sesame seeds or even my creamy cumin and tahini dressing (here!). Remove seeds and skin from jap pumpkin and cut into medium-sized wedges. Add to a lined baking tray and drizzle with 1 tbsp olive oil. Season with salt, pepper and chilli flakes and add to oven. Roast for 30-35 minutes or until golden and starting to caramelise. Meanwhile, heat remaining olive oil in a non-stick pan. Fry haloumi slices in batches, until golden on each side (about 2-3 minutes). Set aside. Divide mixed greens between two bowls and top with avocado and zucchini. 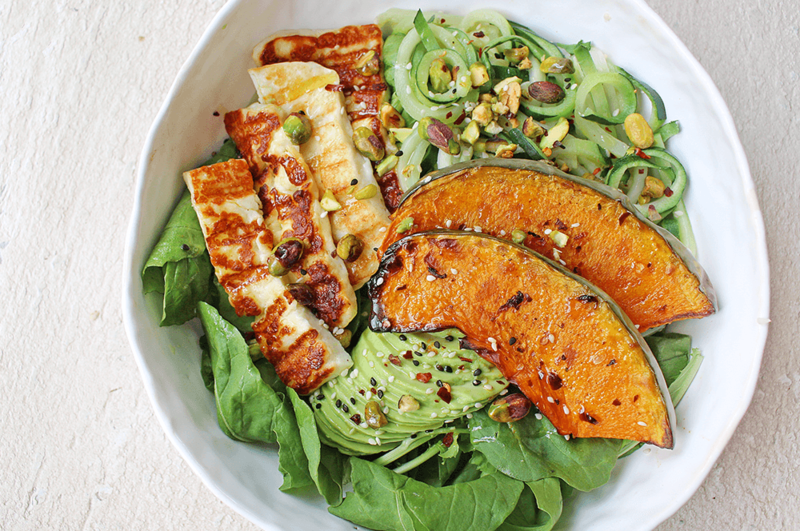 Top with avocado, grilled haloumi, roasted pumpkin and nuts or seeds of your choice. Next PostHow Throwing Out The Scale Will Help You Love Your Body!